H oly %$$@, it's really happening! For the past year, off and on, and for the past few months, really on, I’ve been working on an initiative that's close to my heart, called Authors for Indies. 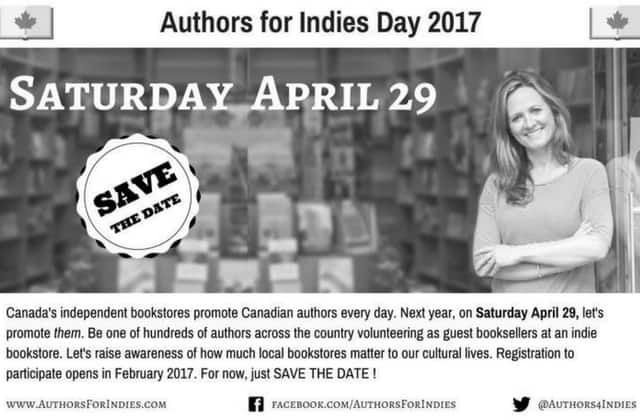 On Saturday, May 2 authors across Canada will volunteer as guest booksellers at independent bookstores. That's right. You can chat with authors, reader to reader, about the books they love and what they're recommending these days. It's a unique opportunity - you don't get to do this at literary festivals or readings. As a book nerd, bookstores are the equivalent of a candy store, but better – filled with knowledgeable staff instead of empty calories. As an author, I appreciate how supportive independent bookstores are of new work. The first time I walked into a store and saw THREE SOULS on the Staff Picks shelf, I levitated three metres off their hardwood floor. I may never get on the Globe and Mail bestseller list, but OMG a bookseller loved my novel! You have no idea what a compliment that is! Once immersed in the publishing world, I couldn’t help noticing that news about independent bookstores was overwhelmingly gloomy. Between eBooks, Amazon, and big box stores, indie bookstores qualified for a listing on Environment Canada’s Species at Risk registry. I wanted to support our writing community, but going to readings and book launches didn’t seem to address an issue that really worried me: how to help the indie bookstores that help authors so much. There are plenty of reasons why shopping local is good for our neighbourhoods. There are plenty of reasons why independent bookstores matter. But even handing over my credit card to a local bookstore wouldn't make a big difference. Except to that one store. In a word: HAH. Maybe even: HAH HAH HAH. Let’s not dwell on all the hours and anxiety. Let’s fast-forward from April 2014 to March 2015. It’s been a great experience. Our little team of volunteers has done incredible work. At this time, 130 independent bookstores and more than 500 Canadian authors have signed up to participate. In less than 2 weeks, we zoomed past 1,000 LIKEs on the Authors for Indies Facebook page. Stores have been telling us about their plans for May 2, which range from teaming up with local bakeries to inviting children to paint on a big mural alongside book illustrators. Eminent authors have sent in guest blogs to express their love for indies, far more eloquently than I can. 60% of stores that have signed up are hosting authors, and there’s more matchmaking going on all the time. The Authors for Indies website rocks. C'mon, it really does. No regrets for all those hours and anxieties. Not a single one. Join us on Saturday, May 2! Check your province's listing on the Authors for Indies website to see which bookstore(s) near you are hosting local authors. Follow us on Facebook and Twitter for all the latest updates. Read the blogs - a wonderful series is scheduled over the next several weeks with pieces written exclusively for the website by Canadian authors such as: Guy Gavriel Kay, Drew Hayden Taylor, Terry Fallis, Charles de Lint and more to come! PS: on May 2, I will be volunteering as a guest bookseller from 11:00 am - 1:00 pm at 32 Books in Edgemont Village, North Vancouver. So are these wonderful authors: John Vaillant, Grant Lawrence, Cea Sunrise Person, and Cathie Borrie. Then getting over to Hager Books in Kerrisdale to sell books with Caroline Adderson, Carol Shaben, Beryl Young, and my friend and mentor Shaena Lambert.